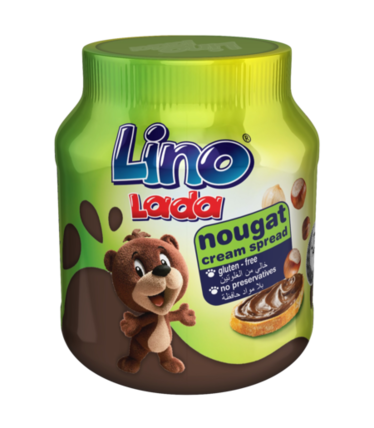 Why does Lino Spread Nougat taste so good? The secret is in the perfect ratio of 13% carefully selected hazelnuts and cocoa. Lino Spread Nougat is also rich in vitamins and minerals. So together with a glass of milk it makes a delicious and nutritious breakfast – the perfect way to begin the day. Hazelnuts are a natural source of vitamin E, and milk is a source of calcium. That’s what makes Lino Spread Nougat spread a nutritionally balanced and delicious choice. Easy to spread, together with bread and milk it makes a nutritious and tasty breakfast that’s particularly beneficial for growing children and physically active people. It blends well with crepes and ice cream, and you can use it to fill traditional cakes such as party... show more Easy to spread, together with bread and milk it makes a nutritious and tasty breakfast that’s particularly beneficial for growing children and physically active people. It blends well with crepes and ice cream, and you can use it to fill traditional cakes such as party rolls or doughnuts. Sugar, vegetable oil, hazelnuts (13%), fat reduced cocoa powder, skimmed milk powder, whey powder, hardened soy and vegetable fat, emulsifiers: lecithin, E471 and aroma. Shelf life: Packaging 20 g, 30 g: 10 months from the date of production. Other packagings: 12 months from the date of production.